It seems that dirty cop Robert Mueller has realized that Judge Emmet Sullivan isn’t going to simply take his word for it that the interview conducted by his hit man Peter Strzok with General Michael Flynn was on the up and up. Many things have recently complicated the witch hunt and it’s public perception, not the least of which is the evidence of the political bias driving it, something that the seditious text messages between Strzok and Lisa Page have brought to the attention of the nation. There’s also the matter of tainted and fabricated FBI evidence. Judge Sullivan, who was selected to replace Judge Rudolph Contreras when he suddenly recused himself, has a history of intolerance for dirty public officials and the government’s railroading of defendants. He appointed a special counsel to investigate the prosecutorial misconduct against Senator Ted Stevens (R-AK) which resulted in his conviction being overturned. He also ruled favorably a Judicial Watch case that ended a practice of favorable secret evidence entry into hearings by the DOJ which provided them with an unfair and unconstitutional advantage. 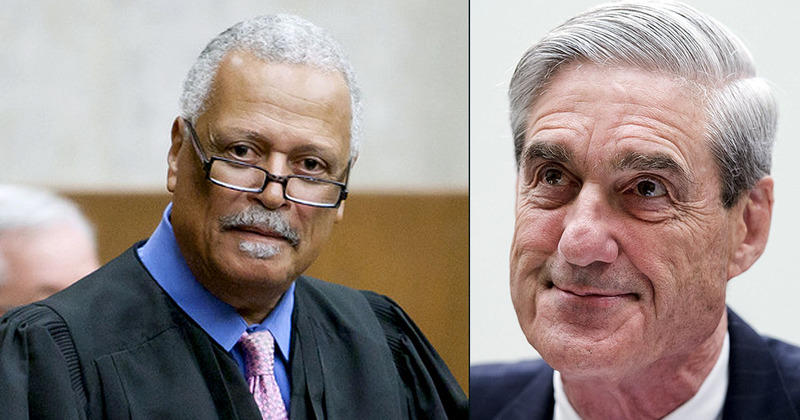 Mueller probably didn’t see his chances as very strong in going head to head with Judge Sullivan who will most certainly ask some questions Mueller and his inquisition don’t want to answer. As a result, on Wednesday, Mueller backed off to let things sort themselves out and see if he still wants to attempt to put General Flynn behind bars and continue his persecution or if those efforts would simply prove damaging to his own weak credibility and provide an avenue by which he could be forced to explain some things he really doesn’t want to talk about. The Wednesday filing states that “Due to the status of the Special Counsel’s investigation, the parties do not believe that this matter is ready to be scheduled for a sentencing hearing at this time.” That status appears to be the falling apart of the Democrat witch hunt and the potential criminal charges against and removal from office of those who are key players in it, including the prosecution of General Flynn. The evil of the left can’t stand up to the righteousness of the truth embraced by the patriots of the right. They thrive in darkness like the vampires they are, sucking the life out of good and honorable people like General Flynn and President Trump. Look out you devils; here comes the light. More and more it becomes clear that the false dossier funded by Clinton DNC was illegally used to obtain FISA warrant. Obama Administration then used the warrant to surveil and illegally unmask LtGen Flynn. Fruit of the poisoned tree means that Flynn’s conviction is extremely dubious and likely to be overturned. Mueller stacked his team with Clinton and Obama supporters and engaged in a clearly biased witch hunt for an unspecified crime. The Special Counsel should be sent packing ASAP. Up until now Mueller thought the statement…”Here Come De Judge” was just a line of a Laugh In character. He now has a different tune to sing. It is a real Judge who may want to review the facts surrounding the coerced confession. There go de Special Prosecutor. I’m so glad to hear this Rick, thank you for writing it up, and thank God for Judge Sullivan. Great, some good news. I am of the understanding, not being a lawyer, that Flynn did nothing illegal. It was that globalist scum Pence who is responsible for Flynn being removed. I know why Pence did it, but why did Trump not LEAD and keep Flynn. I guess just like all the other patriots he needed to go. ?? Flynn neglected to mention some details he considered insignificant when he spoke with Pence and then with the Mueller crowd. This was interpreted as lies of omission… enough to get him accused of having lied. I wonder how many time Pence has lied in the same manner? Funny, I also thought Mike Pence is part of sewer and it was him who wanted Flyn out of picture. General Flyn was in line to be the Vice President. Shameful what has happened to him. you just CAN’T BEAT AN HONESTY JUDGE, and this Judge has a history of NOT going the PC ROUTE AND FALLING INTO THE LIBERAL HYSTERIA TACTICS.